I get it, you like going fast…..
You like to rip through those turns sliding your wheels. The problem is if you drive or ride too hard on the street, you’re asking for trouble…. Police, points on your license, broken bones or worse. So you get on the race track and do track days or club racing, but the best life insurance for motor racing can get expensive if you buy it from the wrong company. You need to deal with an agent, broker or website that knows what they’re doing and can shop your case to many different companies…. Your agent needs to have a system to summarize your racing in the best possible way to get offers from numerous insurance companies….and then needs to be able to negotiate on your behalf. Only then will you be pleasantly surprised with the outcome!! 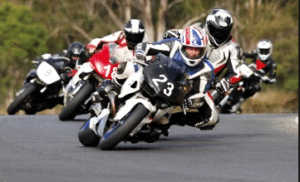 Whether you race automobiles, motorcycles, boats or anything else with a motor, as long as it’s closed circuit racing with a sanctioning organization making sure all vehicles are inspected and safe, you will be insurable. But do you have to admit to doing it on a life insurance application? App #2- Have you in the past 2 years engaged in, or within the next 2 years do you intend to engage in, certain activities such as hang-gliding, hot-air ballooning, ultra-light flying, heli-skiing, mountain, ice or rock climbing, cliff or base jumping, motor vehicle racing, motorcycle or any other motorized land or water vehicle racing, or scuba or sky diving? Note that in application #1 above, the question pertains to “motor sports events or racing”…..I’d avoid this company if you do any track days since there is a definite “gray area” as to what an “event” is considered. The # 2 application above specifically only asks about motor vehicle “racing”……so this is the company that I’d recommend you apply to if you do an occasional track day. All insurance companies have different wording when it comes to their question about hazardous avocations, so make sure you only apply to a company that only has question about “racing” on their application. Don’t over-share or provide any more information than what is specifically asked…..
You also never want to lie or “mislead” on an insurance application, so you don’t have to risk a death claim ever being contested….so just make sure that your agent chooses the best insurance company for you. The goal should be for you or your agent to find the best rate and insurance company for your specific situation. Client races his Porsche. He is a member of the Porsche Club of America. 2005 Porsche 911 GT3, 3.6 liters displacement, 390HP. Full roll cage and automatic fire suppression system. Types of tracks – Various East Coast Tracks, closed circuit road course. Last 12 months – 5 races, total miles 210. Avg distance each race 40 miles. “B”- Tentative Standard due to auto racing activities. “R”- Based on the information provided, best case would be Standard Non-Tobacco. “A” – Ok possible standard plus. Keep in mind the above were the best offers….there are insurance companies that would charge this gentleman a “flat extra” premium of $2.50 per $1,000 or higher. On a $1,000,000 policy, this $2.50 flat extra equates to an additional $2,500 per year that this gentleman would have to pay in addition to the regular rate. I don’t know about you, but I want to pay as little as possible for my life insurance…and I definitely don’t want any company tacking on an additional $2,500 to my rate. As long as you’re on a closed circuit race track, like Daytona, Road Atlanta, Willow Springs, Road America, etc…. And you race in an organization like the AMA, CCS or WERA, that requires safety inspections, you should have no problem qualifying….but the offers you’ll get can vary GREATLY!!! 30 YO male non-smoker excellent health needs $1,000,000 of life insurance. He’s only raced 1 time in last 12 months and will race 8 weekends in next 12 months (approximately 3-4 – 20 minute races per weekend). 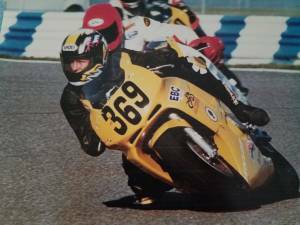 He races 600cc sport bike in CCS and WERA events on tracks like Pocono raceway, top speeds 150 mph, average speeds 75-85 mph. It’s amateur racing strictly for fun. On a $1,000,000 policy, the above $7.50 per 1,000 extra premium equates to $7,500 more than you’d be paying without the extra premium……OUCH, that hurts more than actually crashing the motorcycle! Without the 4 walls and 4 wheels of automobiles, motorcycle racers get underwritten a little more strictly due to the increased likelihood of injuries in motorcycle crashes…. Like they tell you in road racing school, there’s 2 kinds of motorcycle racers….those that have crashed and those that will crash!! I, unfortunately, know about this all to well with some nagging old racing injuries. “L” – Flat of $2.50 per thousand subject to avocation supplement, MVR, full records, etc. “R” – Assuming there is no hydroplane racing, that this is off-shore racing with speeds under 150 mph, then we would apply a 5.00/1000 flat extra and standard rates are the best available assuming he otherwise qualifies. 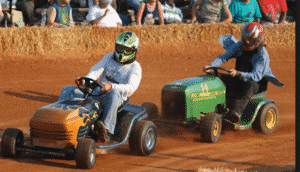 Whether you race snowmobiles, lawnmowers or anything else with a motor, there’s going to be one insurance company that offers you the best rate…..
Finding that company may be the hard part. We have shopping for life insurance for motorized racers down to a science, plus we have over 121 insurance companies we can offer you. If you don’t feel your agent can get you the best rate and value possible, give us a call, send us an email or simply click on the accurate quote link above and we will send you quotes and information on the best life insurance available to you!